PLANO, TEXAS. 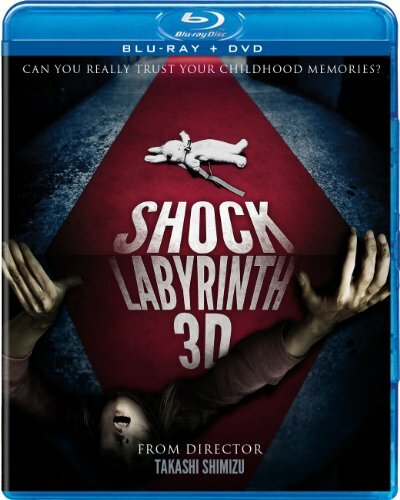 (March 14, 2012) - Japan's first full-length, live-action digital 3D feature, Shock Labyrinth 3D debuts on Blu-ray(TM) + DVD Combo Pack and DVD May 8th from Well Go USA Entertainment. The horror-thriller follows a group of teenagers dealing with the sudden return of a friend who went missing a decade ago. When the friend falls ill they take her to a hospital, but end up trapped in a horrific labyrinth. The film was inspired by Fuji-Q High Land's famous "Labyrinth of Horrors" haunted house ride, and the film was shot at night in the amusement park. Yagira Yuya (Nobody Knows), Maeda Ai (The Sword of Alexander), Renbutsu Misako (Ikechan to Boku) and Katsuji Ryo (The Shonen Merikensack) race against time to escape the maze alive in this eye-popping horror thriller from director Takashi Shimizu (The Grudge series). The bonus materials include the making-of featurette "Behind-the-Scenes of Shock Labyrinth" and interviews with the filmmakers. Ten years ago Yuki disappeared at the amusement park haunted house. One rainy night she suddenly returns, and faints in front of her shocked friends. Her friends rush her to the hospital, but what awaits them is an endless labyrinth of unspeakable horrors. Shock Labyrinth 3D has a runtime of approximately 99 minutes and is not rated. Well Go USA, Inc. (www.wellgousa.com) is a theatrical and home entertainment distribution company that specializes in bringing top content, including the best in Asian Cinema to North America. As a leader in independent film distribution, Well Go's titles can be seen across a variety of formats and platforms including in theaters, on DVD, Blu-ray, digital (video-on-demand, electronic sell-through and streaming) and broadcast television through cable and satellite. Since 1994, Well Go has acquired and released over 2,000 titles worldwide. In 2005, Well Go expanded its distribution to North America where five to ten titles are released monthly. Well Go USA's corporate headquarters are in Plano, TX with offices in Taiwan and China.